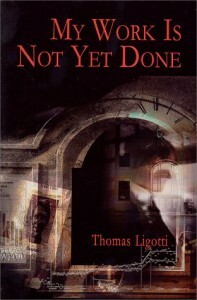 Ligotti's been in the news recently because of the whole 'True Detective' plagiarism hoo-ha, about which I have no opinion at all, except to be amazed that I had ordered two books by this author just before it broke. Well OK, it probably was. I hadn't heard of Ligotti until The Book Depository's algorithm picked up on my purchase of The King in Yellow and made a recommendation. I'm a chapter in to My Work is Not Yet Done and loving it. Just loving it. Anyone else read Ligotti? Any opinions on him - or the TD thing? ?